The rich cultural heritage of Azerbaijan has its source in Zoroastrianism (azer means “fire”) which was introduced here through the Achamenids around 550 BCE. Through the centuries, the region was exposed to the interests of many political powers including Greeks and Parthians. In the 1st century BCE, Caucasian Albanians established a kingdom here and despite numerous invasions of the Sassanids and Byzantines the country survived until the 9th century. In the 7-8th centuries CE, Arabs expanded their control over the region and since then the territory witnessed the ebbs and flows of numerous dynasties and tribes, the most significant of them being a Central Asian tribe of Seljuk Turks. The last ruling dynasty of Safavids introduced Shia Islam to the whole area of present-day Azerbaijan. The collapse of Safavids was a spur for emerging numerous independent khanats which were incorporated in the Russian Empire in the end of 18th century. In 1917 Azerbaijan, together with Georgia and Armenia, formed the Transcaucasian Federation which, however collapsed few months later, following which the country declared independence as the Democratic Republic of Azerbaijan. Subsequently, in 1922 the country fell to the Red Army and was incorporated, together with Georgia and Armenia, into the Transcaucasian Soviet Federative Socialist Republic, in 1936 becoming a separate Azerbaijan Soviet Socialist Republic. Finally, in 1991, following Perestroika and the dissolution of the USSR, Azerbaijan regained independency. As the whole region of the former Soviet Union, the separation from the USSR resulted in a collapse of the centralized economic system. Azerbaijan faced a declining economy, increasing poverty and huge unemployment. 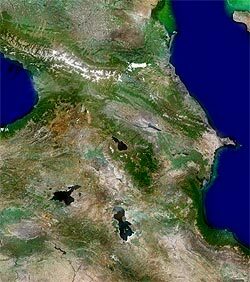 The territorial conflict with Armenia become one of the more reason of hampering the economic growth. While the economic situation of the country still needs improvements, Azerbaijan’s gas export, oil production as well as transfer of these resources has been increasing every year, building a huge potential for development. In addition, Azerbaijan has rich resources of iron ore, cobalt, zinc and cooper. Azerbaijani agriculture is the second largest sector of the country. The culture of Azerbaijan has developed as a result of many influences, including its Turkish, Persian, Islamic, and Central Asian heritage as well as Russian influences due to its former status as a Soviet republic. Today, Western impact, including globalized consumer culture, is strong. The majority (95%) of Azerbaijan’s population are Muslim of which 80% are Shia and 20% Sunni. Under various influences which included Zoroastrianism and local customary law, Islam in Azerbaijan formed an original, synergic culture. There is also a Christian minority in Azerbaijan which consists mainly of Russian Orthodox and Armenian Orthodox communities. Followers of other traditions include Jews, Roman Catholics, Lutherans, Baptists and Molokans.